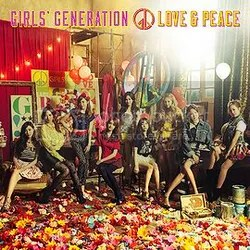 LOVE&PEACE is the third Japanese album by South Korean girl group Girls’ Generation, released on December 11, 2013. The album debuted at #1 on the Oricon Charts and has sold 61,073 copies in its first four days. Gossip Girls is the perfect track to open the album with a lot of fierceness and sass. Electronic pop beats and synths dominate this song and they work perfectly well with the girls’ vocals (which are very well produced to be honest). This track doesn’t put the focus on vocal abilities but more on the danceable melodies, yet there are some good adlibs near the end. After the expected motorcycle rev we get into the next powerful electropop track with amazingly catchy hooks. This time, the vocals steal the show much more while the song is still heavy on the electronic and digital effects. I agree with fellow reviewers that some lines make you think of Michael Jackson’s ‘Wanna Be Startin’ Something’, which makes it very memorable. FLYERS is amazing! True, its similar to those typical anime theme songs, but the fact that this is a more pop/rock influenced song makes it stand out immediately. Especially because I know these girls for their electropop influences. This track is very strong, catchy and extremely uplifting, and it also features some amazing vocals by the girls. Definitely recommended. Moving onto one of the singles. GALAXY SUPERNOVA works perfectly after FLYERS because it has a certain amount of energy, but it’s more sustained and toned down. It’s the perfect track to show off the good vocalists in this group, especially the girls doing some of the powerful adlibs. It could’ve been more powerful for a song called GALAXY SUPERNOVA, but there’s nothing to be really negative about here. LOVE&GIRLS was one of the songs I have loved over the summer, and not only because this song breathes summer energy. It’s uptempo, sassy, experimental and you musn’t take it too serious. The vocals in this track emphasize more cuteness than in the other tracks on the album, but every album needs this track to just go with it and give you a good time. Empty as hell, but soooo catchy. Okay, I didn’t expect BEEP BEEP on this album, especially since it was just a B-side released on the ‘FLOWER POWER’ single over a year ago. I don’t think anyone expected this, but oh well. It’s a real SNSD pop powerhouse with cute vocals and lyrics, simplicity at its best. It features more of the Ke$ha-ish singsong vocals, but it fits the careless nature of the overall song. Pretty nice. Tiffany and Taeyon have always been good at singing English lyrics, so the opening to My oh My was very strong! It’s a funkier approach to pop, a combination that is most prominent in K-pop this year. SNSD brought it to J-pop succesfully, not delivering an overly cute performance. Standing O for Taeyon’s adlibs, amazingly catchy track. LIPS is one of the new songs on the album and the groovy pop sound bring some of Koda Kumi’s vibes on the album. The beats are midtempo and very enjoyable, leaving much room for the synths to build a nice and groovy foundation for the track. I love how the girls infectuously repeat the lines ‘Can’t stop thinking about you // This must be what crazy feels like‘, it’s bound to stay in your head for the rest of the day. When I heard DO THE CATWALK for the first time, I though it was indeed the perfect runway song. It’s funny and catchy with those whistle sounds in the background during certain parts of the song. Although some of the lyrics aren’t all that original, it makes the song memorable. I love their references to fashion capitals like Paris and New York, it gives the song its very own concept and theme. Karma Butterfly follows a clear Eurodance style, which is highly unusual for a group like SNSD. The constant pulsing beat and deep synths create a midtempo dance climate for the girls to show off some good vocals in the chorus, while keeping it more on the down low for the verses. It’s a very good song, but I’m less in love with this one than I am with certain other songs. I only had to hear Lingua Franca once to become addicted to it, this is immediately one of the best songs on this entire album. Although it was the B-side for LOVE&GIRLS, it was the perfect laid back counterpart for that song. It follows a very distinguished pop/R&B style with nice acoustic guitar riffs in the background, which makes it a very breezy and uplifting track. I love this one eternally. The obligatory ballad closes the album, and although Everyday Love is the only ballad on the album it doesn’t stray too far from the overall sound the other songs had. With its soft pop style it’s the perfect song to follow Lingua Franca, bringing the album to a sweet, simple and soft close. I love how they name the days of the week in the lyrics, it adds so much to the overall infectuousness of the song. Perfect! This is such a solid album, and it didn’t surprise me very much after the release of ‘I Got A Boy’ earlier this year. That was my first introduction to SNSD’s music, and it didn’t let me down. LOVE&PEACE, their Japanese release of the year, again shows me how great this group is and that I should finally dive into their discography to discover their most famous songs released some time earlier. As for this album, it’s an amazing uptempo collection that shows multiple sides of the group, without failures and bad tracks. I think I can fall in love with this album even more over time, but for now I’m more than pleased!